You may have a question like “how to replace images for retina display”. The answer is simple. We can do this in many ways. You can do it with CSS Media queries, with 3rd party plugins like retina.js or with jQuery. I found jQuery is very simple to use in any static websites. So here is a small tutorial on how to Change image for retina display. The Script will first check the device whether it is retina display or not. Then it will replace all your images in the HTML with Retina images. Otherwise, do nothing. After that, you have to copy your normal images into “images” folder and your retina images in to “@2x” folder with the same name. Please include jQuery in your </head> section. You can leave it if you already included it. 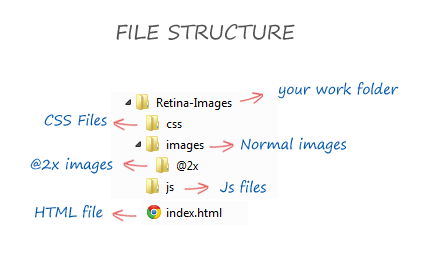 Next, Create a blank js file in your “js” folder. Then include it in your <head> section just after the jQuery Library. We can add our script in to this file later. Copy and paste the following code to “script.js” that we have created early. This script will check the device whether it is retina or not. Copy and paste the following code to “script.js” just below to the previous code. This script replace path of all images in the HTML. That’s it. You are done. Now run your HTML and check it in Retina devices. Your image path will be look like the following in Retina devices. Did you like this tutorial? If so, please share it with your Friends. If you have any doubts, please let us know in comments. You can check for a Live Demo or Download the Source on the left side. You can also use CSS media queries to update your Images called through CSS like background-image. Copy and paste the below code at very bottom of your CSS page.